Water garden features enhance the beauty of your water garden as well as add to the visual appeal of your water garden design. They can be large, dramatic focal points, or small accents that blend in with the overall design. Features can be large or small, simple or elaborate. The best choice will enhance the overall theme of your water garden design. 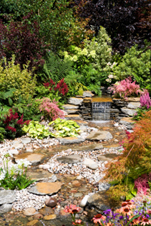 Popular features to include in your water garden design: waterfalls, fountains, waterwheels, streams, sculptures, landscape bridges, rockwork, and lighting. Streams can be easily added to a Kio pond or water garden plan. If you have a natural slope in your landscape, a stream is a simple feature to add. Waterfall features typically feed into a water garden, pond, or pool. Natural looking waterfalls are made out of rocks and boulders of varying sizes. Some modern designs are made out of sculpted metal or sleek marble. Outdoor garden water fountains add the sight and sound of flowing water to outdoor landscapes. They can be used as an eye-catching focal point, or as an accent in the overall water garden design. Water fountains are typically one of three types: spray fountains, cascading fountains, or statuary fountains. Add Spray fountains (usually water nozzles or jets) to spray streams of water in different patterns. Cascading fountains consist of one or more levels. Water cascades or falls down each level into a pond or water garden. Statuary fountains are usually free standing sculptures used in formal pond and water designs. A garden water wheel adds the relaxing site and sound of water your outdoor retreat. This striking water feature adds visual appeal to ponds and water gardens. Water wheels are available in pre-assembled kits, or can be custom built to your specifications. A landscape bridge adds visual appeal and serves a practical purpose; it creates an attractive pathway over your pond or water garden. You have two installation options: If you enjoy do-it-yourself projects, you can build it yourself, or you can hire a professional. 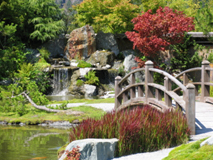 A garden bridge can be custom-made to fit your water garden design specifications. A natural, informal water garden design is enhanced by creatively placed rockwork. Add rocks of all sizes and shapes to add texture and visual interest as well as provide hiding places for wildlife. Lighting is an important feature for safety as well as night-time enjoyment. A well-lit water garden will prevent injuries while providing the option of enjoying the sights and sounds of the water garden at night. Lighting can be added to the perimeter of your pond as well as incorporated underwater.